Berlin's metro is not subject to time. It's dark outside, lit here and there by the soft glow of a run-down streetlight or the pink and blue haze of a neon sign. But not in the metro. Here everything is bright as noon, including the woman standing pensively off to the side, waiting. Waiting for you. "I need you to blow up a building," she says. "I can pay you." Welcome back to Shadowrun. It's only been six months since we were last in Jordan Weissman's magic-meets-cyberpunk setting and Harebrained Schemes has already released Dragonfall, the first official expansion campaign for Shadowrun Returns. And when they say expansion, they mean it—this is an entirely new fifteen-or-so hour campaign just as long (if not longer) than the original game. Rather than continuing the original storyline ("Dead Man's Switch"), Dragonfall starts you off from scratch again: new city, new circumstances, new character. 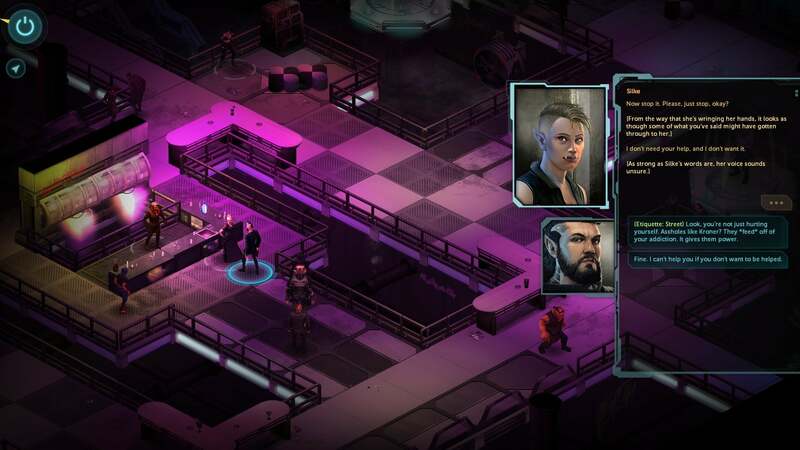 You've recently hooked back up with an old crew of runners—the Shadowrun universe's titular mercenaries—pulling off easy jobs. However, your assertion that there's "no such thing as a milk run" soon proves prophetic, and the crew is swept up into yet another "save the world" type situation. Dragonfall's plot is pulpy in the finest Snow Crash tradition, and in a good way. To its credit, Dragonfall is also paced and plotted far better than the original campaign—whereas I complained that "Dead Man's Switch" felt rather slapdash, losing plot strands at random and wrapping up in a blur, I found Dragonfall much more intriguing. The story is drip-fed to you throughout, and multiple side missions and nonessential characters make Berlin feel more like a bustling metropolis compared with last year's linear Seattle setting. 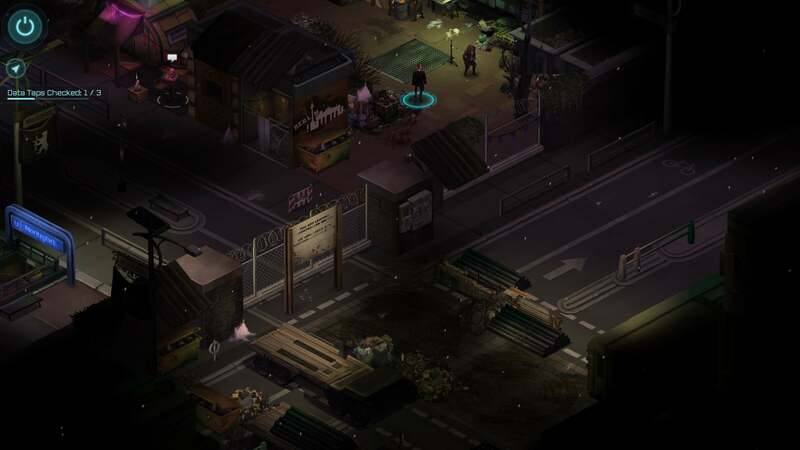 Dragonfall's Berlin is certainly grungy enough to be a city. There's even a lengthy four or five mission subsection that allows you to take on missions in any order and skip missions you feel are unethical. 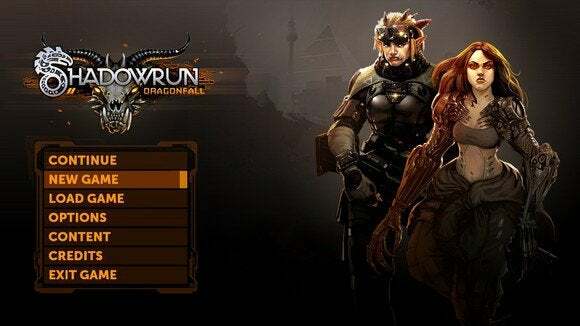 It's not a lot of choice, and at the end of the day the result is the same, but I was amazed how much a little "illusion of choice" made Dragonfall feel more like a traditional RPG and less like a set of linear hallways than Shadowrun Returns. Which brings us back to the exploding building. In Shadowrun Returns, you were the hero. You were going to keep your hands clean and save the world. Maybe you did it for money, maybe for honor, but the story was the story. 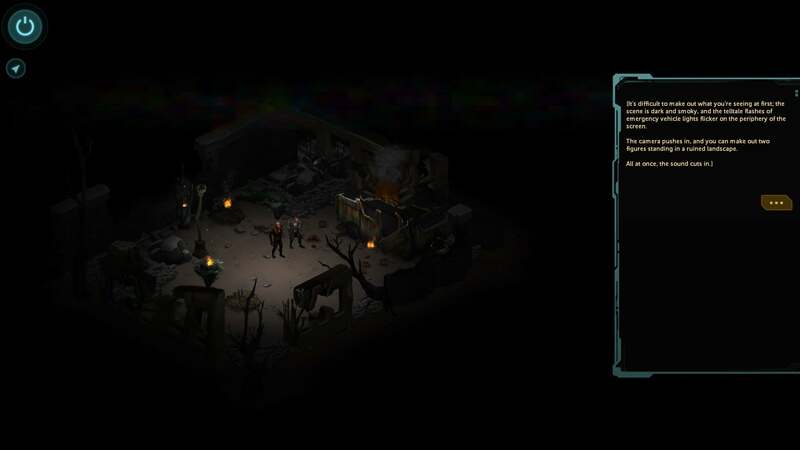 Dragonfall is as morally gray as a slab of Berlin concrete. This is real cyberpunk: Dubious deals made in the shadows, with only personal ethics to guide your hand. Blowing up the building comes with a big payday, and your crew needs the money. Blowing up the building also kills hundreds, many of them potentially innocent despite the woman's assertion that "they're all guilty." Guilty of what? She won't even tell you. Give up this job and the only thing left open to you is a mission where you infiltrate a base and kill a prisoner before he can inform on anyone—also not exactly the loftiest of opportunities for you to take on. Rub shoulders with Berlin's criminal underclass. This is the muck you're playing in; the lowest parts of Berlin's criminal scene. And you have to, because the fate of the world's at stake. It's an interesting quandary, having to play someone fairly villainous in order to potentially do more good later. Coming back to base and seeing how hesitant your crew is about some of the actions you've taken is downright harrowing. Credit goes, once again, to Shadowrun's excellent writing, especially on a person-to-person scale. "Dietrich used to front a punk band." It's the thought I keep returning to whenever I try to describe what makes Dragonfall (and the original campaign) special. I ran with the same crew for the majority of the expansion. Eiger is a distrustful orc who keeps her friends close and her gun closer. Blitz is a decker (read: Matrix-like computer hacker) who I rescued from a sticky situation only to plunge him into a global crisis. This is home. It's safe, warm, and all your friends live here with you. The perfect place to plan illegal operations. And then there's Dietrich, the ex-punk rocker (though it's debatable whether you can ever truly leave the punk behind, even with age). He's the shaman version of Henry Rollins, if Henry Rollins was a fugitive wanted for corporate espionage. The dialogue here isn't just good, it's fantastic. High-concept genre pulp, sure, but it's great high-concept genre pulp. The inane little details of these fictional lives imbue characters with life. I was amazed the first time I complimented Eiger (you know—trying to be the "nice" guy) and she called me out on my insincerity. Because of course she did! That's how Eiger would react were she a real person. But that's still rare to come across in games, and Shadowrun does it better than almost anyone. That being said, the game still has some problems on a mechanical level. The introduction of quicksave and save anywhere functionality is very welcome, helping avoid repetitive, drawn-out engagements. 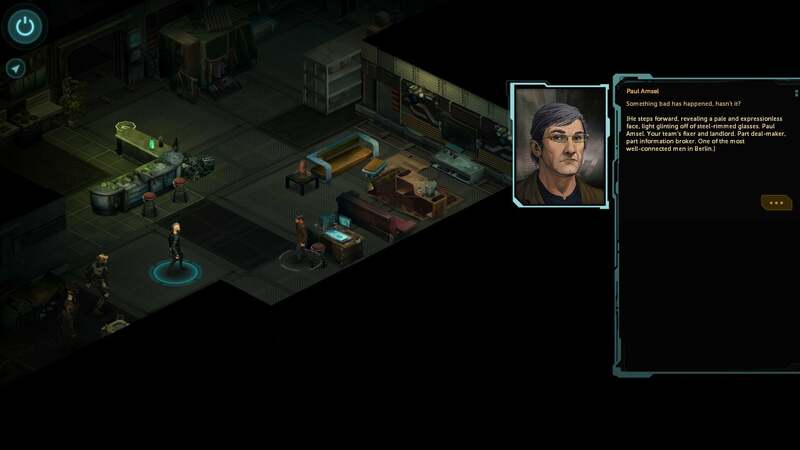 However, this is the only real improvement on the game side of Shadowrun Returns. Dragonfall's writing is uniformly excellent at conveying a certain tone. There are still too many systems crammed into too little space. Dragonfall tries to make some of the non-combat traits more useful by adding more skill checks, but overall I still found myself dumping all my points in Rifles and Charisma. In part this is because Dragonfall wipes your character sheet clean again—you spend most of the game building the fundamentals back up and spec'ing in one direction instead of branching out, as you would with a higher level character. The computer hacking portion of the game, dubbed decking, is also neutered. There are even fewer mandatory decking sessions in this campaign, and no real reason to play as a decker yourself when you'll almost always have Blitz in your party. I still feel like Shadowrun Returns built a solid foundation; these stats have the potential for plenty of depth and experimentation. Unfortunately neither campaign has taken advantage of that potential to its fullest. The expansion plays much like its predecessor—isometric camera, no voiced dialogue, plenty of reading, and lots of systems. In many ways,Dragonfall is the campaign the game should've shipped with from the start. An amalgamation of fan feedback and the developer's own ideas, Dragonfall manages to right a fair number of the original's wrongs, while still delivering the same compelling dialogue and an even better world to explore. If you're just getting into Shadowrun Returns, start here. And if you've already played the original and enjoyed it? By all means revisit the game for this chapter. It's easily worth it for $15. 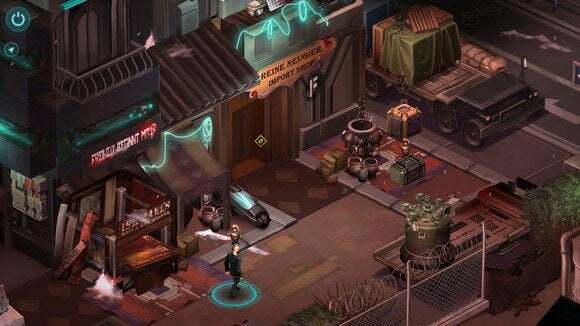 Shadowrun Returns was already good, but Dragonfall makes improvements on every front while keeping the compelling writing and characters of its predecessor.